ADD SOME PERSPECTIVE – From low angle shots to landscape views, you need a DSLR camera tripod that’ll help you capture the perfect photo. Get a tripod with perspective! 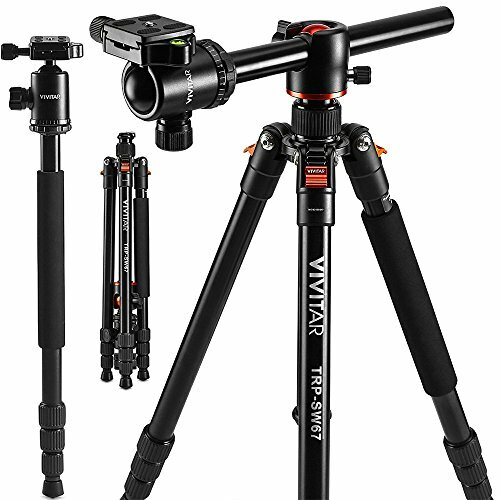 This horizontal arm tripod gets as low as 18.5″ and as tall as 67″, giving you the best angle for every shot! Plus, it converts into a monopod for even more still and video versatility. PICTURES MADE PORTABLE – Heavy camera supplies are a hassle, especially when you’re on the road! 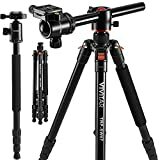 But this Vivitar camera stand tripod is perfectly portable. Your aluminum travel tripod easily folds into a compact package and weighs a feathery 3.5lbs. STABLE SETUP – Make sure your camera is safe, secure, and stable with a steady stand. 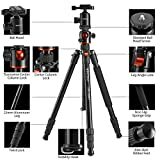 Our tripod for DSLR cameras has legs that lock, and can hold up to 15.5lbs, keeping your valuable equipment safe and your photos crystal clear. PUTTING YOU FIRST – When it comes to your camera accessories, you expect a lot. At Deals Number One, we take pride in the quality of our products. Your photography tripod comes with our unbeatable 1-Year Warranty, so you can purchase with confidence!